Yes it is true! 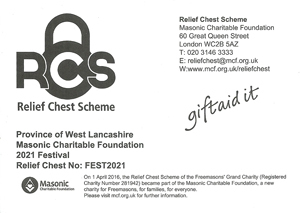 The Relief Chest (White) Envelope Scheme accrues 25% from Her Majesty’s Revenue and Customs on every £1 a tax paying Freemason donate to the West Lancashire Masonic Charitable Foundation 2021 Festival when they make their donation using the white envelope. And every £1 they donate accrues to their personal giving to the 2021 festival. All you have to do is fill in your name, address, lodge number, and the amount of your donation and if you pay tax tick one or both of the boxes to claim their 25% on their donation. Unfortunately, HMRC do not allow address labels to be used on the address slip so why not take a few white envelopes home and complete them before you go to lodge or chapter it’s easier and every £1 you donate becomes £1.25. Did you know the Masonic Charitable Foundation give over £1,000,000 every year to West Lancs Masons, their widows and dependents. Remember you can use the white envelopes to donate to the 2021 Festival, even if you do not pay tax! 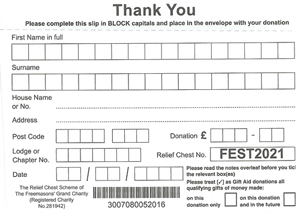 If you want to know how much you have donated to the 2021 Festival, you can ask your lodge and chapter, or group charity steward how much you have accrued from your white envelope donations.